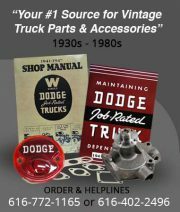 The team at DCM Classics is currently in the process of doing a full restoration 1950 Dodge B2B for John Clouse of Jackson, NJ. The vehicle was delivered to DCM in late in 2018. Exciting News! More Officially Licensed by MOPAR Emblems!